(above) Participants in a recent Painting Night at the Oswald J. Nitschke House in Kenilworth are joined by resident artist-instructor Patricia Hubinger (at left) as they show off their paintings. Additional Painting Nights have been scheduled in April, May and June. For information/reservations or to arrange for private painting parties, please call 908-709-0434. Gift certificates are available. The Kenilworth Historical Society is presenting a continuing series of “Painting Nights” with resident artist Patricia Hubinger to benefit the historic Oswald J. Nitschke House “living history” museum and cultural arts center. The enlightening, enjoyable, two-hour painting sessions, held in the Nitschke House cultural arts center (49 South 21 Street, Kenilworth), give participants of all ages, backgrounds and abilities an opportunity to create unique paintings under the guidance of a master artist instructor. The next “Painting Nights with Pat” will take place on Tues., April 16; Thurs., May 2; and Tues., June 18, from 6:30 to 8:30 p.m.
Acrylic paint, brushes, canvases, easels, smocks and other art supplies will be provided as part of the $25 admission price. Participants are asked to arrive by 6:15 p.m. and are invited to bring food and beverages. Advance registration is required, as seating is limited. 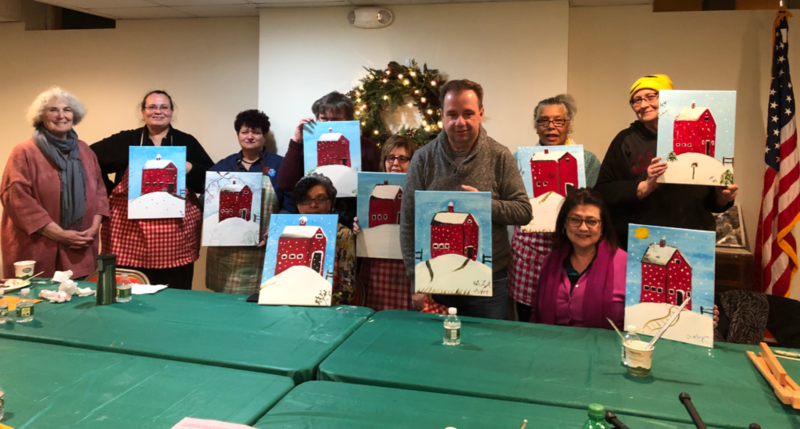 To make reservations for any of the Painting Nights, to receive information about future painting sessions and/or to arrange for private painting parties, please call 908-709-0434. Gift certificates are available. Proceeds will benefit the Kenilworth Historical Society’s Oswald J. Nitschke House (c. 1880) “living history” museum and cultural arts center by helping defray the cost of an elevator that makes all levels of the newly restored site fully accessible to everyone. The Kenilworth Historical Society is an independent, volunteer-based, non-profit, tax-exempt, 501(c)3 organization dedicated to the research, preservation and interpretation of the Oswald J. Nitschke House, local history and culture.